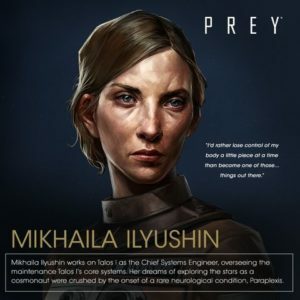 This page contains the character profile for Mikhaila Ilyushin in Prey, including story information, interactions and missions involving her. This is a Prey character profile guide. Here you will find details on Mikhaila Ilyushin, a supporting character in Prey. Mikhaila is the Chief Systems Engineer on the Talos 1 and is devoted to ensuring the optimum performance of the space station’s core systems. She would have pursued her aspirations as a cosmonaut if not for an unfortunate neurological condition called Paraplexis. Mikhaila was the ex-lover of Morgan Yu. They broke up right before Morgan’s memory was erased due to neuromod removal. You can choose to kill her, let her die, or save her. If you choose to save her, you’ll be asked to look for her father, whose only trace on the station are possible mimics and an audio log in Deep Storage‘s Confidential records.